Cathay Pacific vs Emirates Business Class – Which One Is the Best in 2017? Traveling in business class is a prerogative of people who know the price of time and comfort. It is the balanced solution between the luxury first class and the cheap coach. The largest share of passengers of premium class cabin is represented by top managers, directors and executives. However, it does not mean that regular customers avoid an opportunity to experience all the benefits provided in the cabin for elite customers. The following article provides a comparison of Cathay Pacific vs Emirates Airline in view of quality, comfort, servicing and other features both in the air and on the ground. The largest air company of Hong Kong is called Cathay Pacific. This airliner sends its aircrafts to 44 countries worldwide, which include 180 destinations. The fleet of this prominent air carrier from Asia is represented by Boeings and Airbuses. The company has recently upgraded the premium class cabin on most of routes. However, the best business class solution of Cathay Pacific is provided on the board of Boeing 777-300ER. Emirates Airline is the largest air company in the UAE and in the Middle East. Every week more than 3,600 flights are operated by the company. These flights deliver passengers and cargo to more than 140 cities around the world. For the recent years, the company has achieved many results and awards. The fleet of Emirates comprises the aircrafts produced by Boeing and Airbus companies. Similarly to many famous world airliners, Emirates counts on Airbus A380 regarding the best business class configuration. Of course, the company provides other aircrafts such as Boeing 777-300ER equipped with premium class cabins, but they are considered outdated. So, let’s compare the features of Cathay Pacific vs Emirates business class. We will start our comparison from the ground. It is important to provide the customers with the qualitative servicing before boarding. The air carriers try to offer the most comfortable solutions for the premium passengers in their lounge areas. Cathay Pacific offers elite lounges that are known for its special interior design. Since, the company operates numerous destinations, the features and quality of various lounge areas may differ. Nevertheless, almost in each Cathay lounge the passengers of business class are able to have a rest in private areas, to relax in shower suite and to enjoy exquisite restaurant food. Shower suites of Cathay Pacific deserve a special attention, because they are equipped with bath and bed to relax after shower. The lounge areas offered to the premium customers of Emirates are usually very spacious. The area is equipped with numerous tables, seating areas and corners of various designs. If you need a PC for work, you can easily find it in business hubs that look like cubicles. The rest areas are fitted with leather chairs. The dining options provided by this air carrier are also up to the mark. You can get lost in a variety of snacks and beverages. The shower rooms in the Emirates lounges are very nice and comfortable. Besides, Six Senses spa saloon is located on the territory of the area, where you can order some treatment. Unfortunately, only the first class passengers can enjoy a 15-minute treatment for free. If you want to choose the best lounge of Emirates versus Cathay Pacific Airline, you should take into account that the areas in the top destinations will be much more advanced than in secondary destinations. To feel the difference between elite class and coach, you need to plunge into the premium class seat. The regular configuration of the seats in the business class is resembles a herringbone. There are three rows in total – the middle one comprises two seats, while the side ones have only one seat at the window. The premium class seats of Cathay Pacific and Emirates are located in this arrangement. The difference between both airliners lies in the private space. The comparison of Cathay Pacific seats vs Emirates Airways shows that the seats in Cathay are larger (82” long and 21” wide), while Emirates offers a bit less private space (76” long and 18.5”). 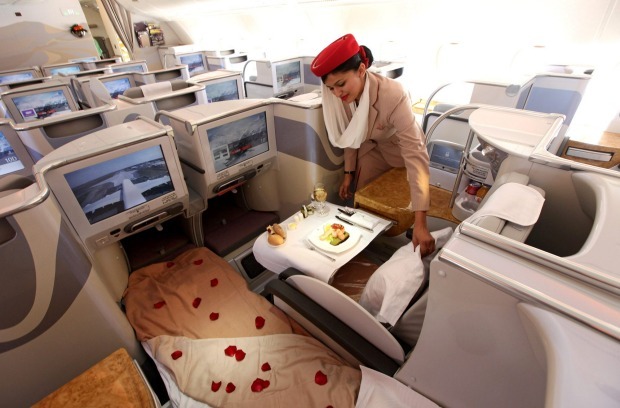 However, the business class seats in both airliners are converted into bed. The outfit of seats is standard without any special features. You will find slots for magazines, storage spaces, bottle holders, touch screens, USB slots and many other essential features. It is recommended to pay your attention to Emirates Airways business class review, while this company offers an interesting design that varies depending on the aircraft model. The selection of Cathay Pacific vs Emirates Airlines food & beverages is both amazing and ordinary. If you travel in business class cabin for the first time, you will be surprised and astonished with a variety of meal options in the menu. However, it is rather difficult to wonder a regular elite passenger. Dine on demand in Emirates business class is not offered. This is a key distinction from other air companies from Middle East. The lunch menu includes 3 options of appetizers, 3 options of main course and 3 options of dessert. The wine card and list of beverages are really impressive. It is interesting that most main courses in business and first class of Emirates are the same. The passengers are also provided with a bar in the back of the cabin. The elite customers of Cathay Pacific are offered with the following lunch menu: 2 options of appetizers, 4 options of main course, and dessert. The menu of beverages offers a wide selection of alcoholic and nonalcoholic drinks. Cathay Pacific also provides no on demand meals. The food is delivered on large cart and distributed to the passengers. The question “Is Cathay Pacific or Emirates Airlines better in dining?” is not relevant, because both companies proved top quality servicing. If you ask, “Where is the best amenity kits?” you can choose the winner by yourself. Both Cathay Pacific and Emirates Airlines offer luxury amenities manufactured by famous brands. The Emirates amenity kit is provided by Bulgari. The content of the kit includes Bulgari products, hairbrush, mirror, toothpaste and toothbrush, and razor. Unfortunately, no sleeping mask and pajama are offered to the elite customers. Emirates Airways or Cathay Pacific business class review contains more detailed information about IFE and other business class features provided by these airliners. 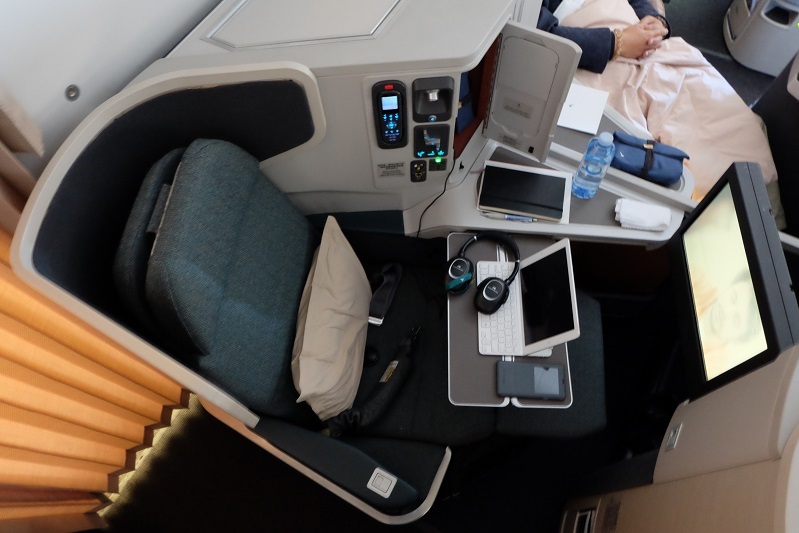 We have already found out that the seats in Cathay Pacific business class are larger. Nevertheless, are they the best for personal space? Emirates offers great design and outfit of the seats in its premium class cabin. Passengers admit an incredible comfort that they experienced during the flight. The customers of Cathay Pacific also has no complaints about convenience on the board. Both companies offer seats that turn into beds, and all the required tools for sleep including duvet and pillows. It is difficult to answer, “Which airliner has pillows, duvets & bedding best?” because you will hardly find a passenger who was dissatisfied with bedding options or services. Each airliner has own advantages and almost no flaws. However, the most demanding customer can find some drawbacks that anyway will not spoil the total impression of quality and effectiveness of services in the air and on the ground provided by Cathay Pacific and Emirates Airlines. It is up to you to make a choice and decide which airliner is the best.